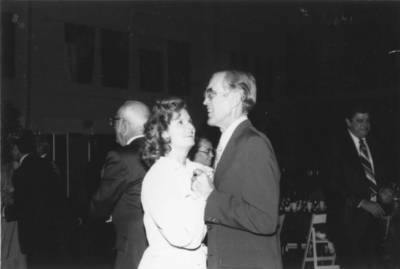 "51st Annual Founders Day Celebration and dedication of the Harold Hutt"
51st Annual Founders Day Celebration and dedication of the Harold Hutton Sports Center, held in the gymnasium, Chapman College, Orange, California, November, 1979. Edy and Ernie Chapman dance to the music of Les Brown's band. BW photograph; 3.125" x 4.5"